Make your products, packaging, and everything else you can think of stand out with our die cut roll labels. Custom cut to any shape, these are exactly what you need to give something a professional touch. Use them with an application machine or apply them by hand. Either way, these durable labels are laminated to be scratch-resistant and waterproof, making them versatile and professional. We do not recommend use outdoors, as ink may fade over time in direct sunlight. 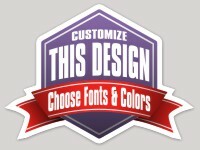 Upload a design or use one of our pre-designed templates to have a label created in minutes. fantastic! came quick and was accurate. thanks! Will be using you guys more and more. The Roll Stickers look great. They feel like they are a bit thinner material and easier to crease than the standard stickers. Overall we love them and they will work perfect at a cheaper price. My stickers came out great! I ordered die cut. Perfect, great quality. Great communication from staff! Beautiful Stickers and Great Service! MakeStickers printed *1,500* stickers for our organization's membership program and went above and beyond to make them perfect! Their quality is exceptional---You won't be disappointed! Plus, they love dogs :) Win-win! Thanks for the beautiful stickers - as good as I had hoped! love them. thank you so much.